De la même manière que Rome n’a pas été construite en un jour, beaucoup pensent que Pompéi ne peut pas être vue en un jour. Eh bien, ce n’est pas vrai. Cette excursion d’une journée au départ de Rome ne prend pas seulement les ruines antiques de Pompéi, elle inclut également la ville voisine de Sorrente au début de la côte amalfitaine, classée au patrimoine mondial de l’UNESCO. Cette expérience en petit groupe, avec transport en train à grande vitesse, est limitée à 15 personnes. Rendez-vous sur la Piazza dei Cinquecento pour rencontrer votre guide pour la journée. Ensuite, montez à bord de votre train pour le voyage à grande vitesse à destination de Naples, puis poursuivez votre transfert en direction de Pompéi. Contournez les lignes d'entrée et dirigez-vous directement vers l'intérieur avec votre billet coupe-file pour explorer les fouilles archéologiques. Votre visite se déroule dans les rues autour de la ville antique ainsi que dans le domus de Pompéi, un site auquel votre groupe a un accès exclusif. Découvrez la noblesse de la classe supérieure de Pompéi qui vivait dans ces maisons en vous promenant. Faites une pause pour faire des emplettes de souvenirs et peut-être un en-cas, puis détendez-vous lors de votre voyage à Sorrento: porte de la côte amalfitaine. Sirotez le limoncello local, la liqueur populaire du sud de l'Italie, et écoutez votre guide vous raconter des histoires de la culture et de l'histoire de Sorrente pendant que vous explorez les boutiques d'artisanat de la ville. Profitez au maximum de votre temps libre pour le déjeuner, puis plus tard, à l'heure convenue, retour à Rome en train à grande vitesse. City Wonders guides did an amazing job! Pompeii was fascinating and Sorrento was gorgeous! Highly recommend! Great tour, well organized. Also, the train journey saves a lot of time. 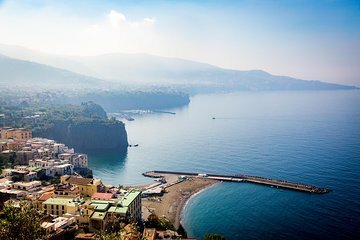 The ruins os Pompeii are amazing and Sorrento is beautiful, and gives us a taste of the Amalfi coast. We had lunch overlooking the bay of Naples! A totally delightful day! Every detail was attened to and ran right on time. I actually signed up for the Pompeii and Amalfi Coast tour. Somehow I was scheduled on this tour. I discovered it that morning at the RR station in Rome. Since the tours were traveling to Naples and then to Pompeii together before they parted ways, and since the Amalfi tour was only half full. I asked to be transferred. They said it wouldn't work because the Amalfi tour took longer and they were booked on a later train and they couldn't transfer the tickets. I asked if I independently bought tickets on the later train could I change. They said no because there wasn't time before the bus left to see if tickets were available. Sorrento was beautiful, we had lunch looking over the sea, and the lemon shop was great. I had a very good time, but I was counting on the Amalfi tour. Excellent trip to Pompeii and Sorrento. Our guide, Ches, was fantastic. The train ride and bus was very comfortable. The guide in Rome was right on time and was very helpful in getting our group to the train. Ches met us in Napoli and we quickly got on the air conditioned bus to Pompeii. The Pompeii guide was very knowledgeable and made the tour very interesting. Sorrento was beautiful and we enjoyed a nice lunch and tour of the town. Great day trip. I would highly recommend. Great tour of Pompei. Guides very knowledgeable and friendly. Sorrento lovely and an afternoon is plenty of time for lunch and to wander around. Small group is a must and worth the cost. Our family of five with two teenagers and a 10 year old had a wonderful day on this trip. Our main guide, Fabian, was great. He was very friendly and knowledgeable and gave us great history and insight about Naples, Sorrento and the whole area. Taking the train from Rome Termini to Naples was easy. Naples seemed very dirty and gritty so we were happy to not stick around there. We had a 20 min drive to Pompeii and a great two hour tour there by our guide, Alfredo. It's an amazing place with so much history. I had been worried we'd have issues with car sickness on our route from Naples/Pompeii to Sorrento, but we were fine. Our bus driver, Mikela, showed impressive driving skills on those small, winding, cliff-side roads. We stopped at a few scenic overlooks for pictures and lemon slush. We went to a lovely restaurant with amazing seaside views in Sorrento and then had a brief walking tour with Fabian. The Lemoncello tasting was interesting but we didn't buy anything. The cameo/jewelry designer demo was very cool. Stop in for a quick visit with him. It was also nice to have a little time to ourselves to explore the beautiful town of Sorrento. We were so happy to have done this tour. We purchased this tour because it was supposed to be limited to 15 people. Instead, our tour was comprised of three separate groups and totaled over 22 people - not including the guides. One of the groups that was included in this tour was an Express Pompeii tour and after speaking to someone from that group I learned that they paid only 50 per person - whereas we paid over 200 per person. I personally feel that the company did not sell enough spaces in this tour and decided to save money by consolidated three different tours/groups into one. I do not appreciate that and feel cheated that we paid so much more than other people. Save your money and work with another company that will respect you and your money more. We had an absolutely wonderful time on this tour! Our tour guide Cesar was very engaging and made everything come to life. He was so passionate and knowledgeable about the sites. Pompeii was so incredible and Sorrento was absolutely beautiful! Cesar recommended a wonderful restaurant with incredible views. We enjoyed the limoncello tasting and Cesar directed us to a great leather factory store. The train was very quick and the tour bus was very large and comfortable. We thoroughly enjoyed our day. This was the best way to get a chance to visit both Pompeii and Sorrento in one day from Rome.